A puzzle that can stir up your scientific bent of mind and remind you of the old school physics lessons, it is the Catch the Berry mobile game launched by the Random House Digital. It is a conglomerate of the latest features that we get to see in many other physics-based puzzle games, and whether Catch the Berry game could catch up the expectations of mobile game lovers, is yet to be seen. To warm you up for the game, Catch the Berry started off with beautiful title cards illustrating the storyline. The game consists of small elf like beings named Telfnords who earn their living by harvesting berries. Among them Huckle, one of the Telfnords goes for his harvesting work and finds out a magical relic that brought the berries into life. Though the story doesn't make any difference to what they were doing, it added an animated feature to the visuals by personalizing each and every berry with human features and personalities. 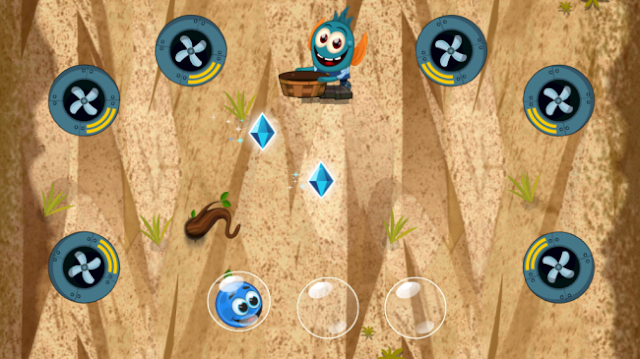 The game proceeds by making a happy berry get into a basket which is with Huckle. Side by side there are three diamonds which the player needs to collect, but yes, that depends upon their choice. The primary task that the game gives you is picking p berries, which will eventually become a very tough one, as the game will keep you at your wits end to perform this apparently easy task. There will be unpredictable barriers, switches that turn off with time and fans that raise up the speed of the berries before you are even ready for it. The sequence of tasks that you have to do is navigating a berry into the basket by creating platforms which are pre-existent in the game setup. There is a limit of the numbers of platforms that can be created, and that is shown at the top of the screen by a blue meter. There is also ample scope to correct a mistake while creating a platform by removing the earlier one. After a while, the task will get tougher when you will need to drive two berries into the same basket with all the challenges thrown upon you, and it will take a lot of patience and practice to master the skill. Where the shoe will really pinch is the functionality of drawing platforms and erasing the previous ones. The erasing option will not allow erasing the lines with ease. Each line has to be erased which had been drawn one at a single stroke. 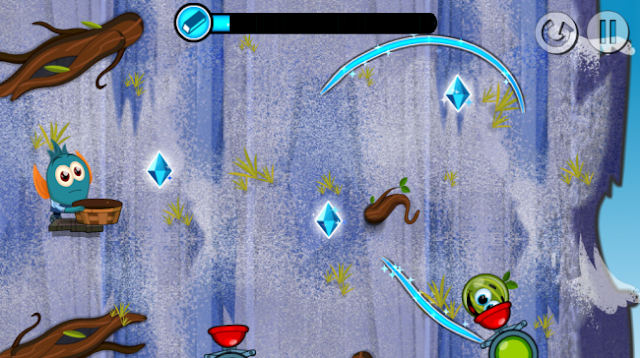 To make it more difficult, the erase button has been distanced quite far from the place of your work, so by the time you go and get it, by pressing the mouse quite often to erase a single line, the berries will disappear, and there will be no other option but to play the same level again. To be specific Catch the Berry is remarkable by its ever changing puzzles which never let a player to predict the game plan in advance. This makes it all the more challenging. With its awesome artistic presentation, the game has developed a memorable series of cartoon characters that comes out lively with the game mechanism and puzzle designs. It is now left on the player to test his gaming spirit along with a scientific twist.